We are very sad to have lost Sidney Cardew, who died on 26th July 2017 at the age of 86. Sid was big figure physically and in other ways too. We remember him for his down-to-earth, uncomplaining character and the great strength he showed in the many years of dedication to his disabled son Steve. 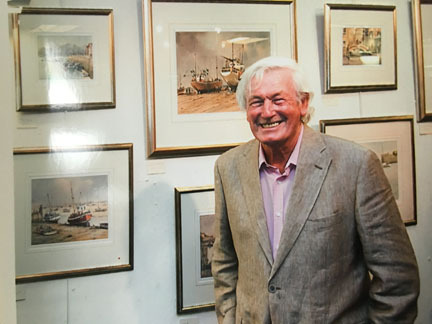 And then there was the painting: you could always depend on Sid to produce good work, which he did throughout his life both for the Wapping Group and for the Royal Society of Marine Artists. He was famous in both groups for always selling at every exhibition, which gives some indication how much his many admirers and collectors appreciated his art. Sid was born in the East End, later moving to Essex. After National Service in the RAF, he served as a senior design engineer with the Ford Motor company before becoming a full-time artist. He was elected a member of the Wapping Group in 1989 and the RSMA in 1998.